The radioactive gas Radon is a hazard occurring in many homes and workplaces. Its represents the second largest cause of lung cancer in the world. Underground workplaces such as basements, mines, caves and utility shafts can have significant levels of Radon as well as above ground workplaces in Radon affected areas. All workplaces including factories, offices, shops, classrooms, nursing homes, residential care homes and health centres can be affected. While employees residing only in upper levels of buildings are unlikely to be exposed to significant Radon levels, personnel in underground workplaces such as cellars, basements and poorly ventilated ground floor rooms are far more likely to be affected. 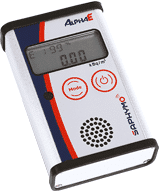 Part of the Bertin Instruments nuclear instrumentation offer, Saphymo products ranging from AphaGUARD and AlphaE radon monitor provide monitoring tools for mitigation, expertise, missions and personal exposure monitoring equipment for Radon risk assessment.